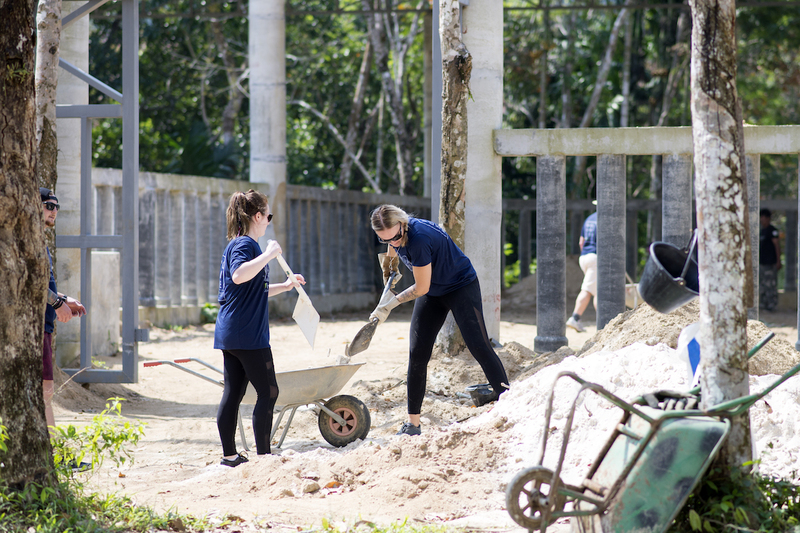 Volunteering at Phuket Elephant Sanctuary is an exciting opportunity to support the first ethical elephant park in Phuket, Southern Thailand. You'll be assisting with tasks around the sanctuary and immersing yourself in the elephant’s life. 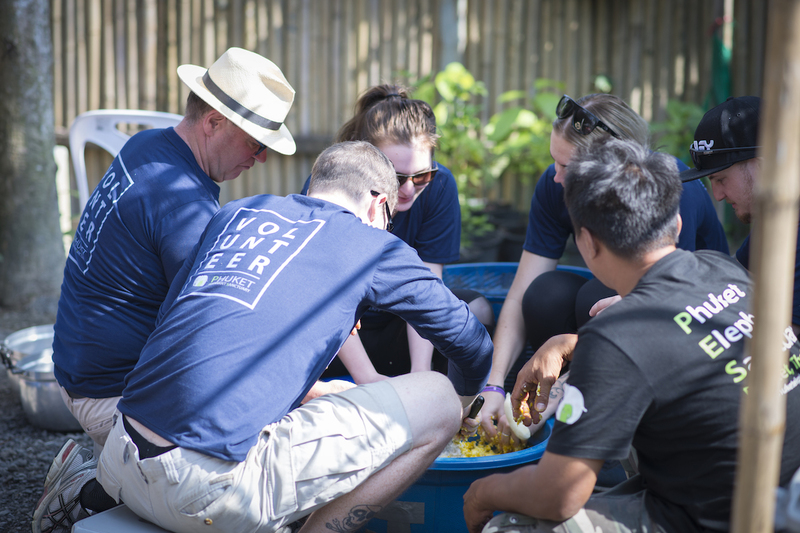 By volunteering with us, not only are you donating your time to help elephant conservation and protection but also know that your financial contribution is going directly towards elephant care providing nutritious food, shelter, veterinary care, and enrichment. We do not require any previous volunteer experience as long as you are a passionate animal lover with a keen interest in wildlife. 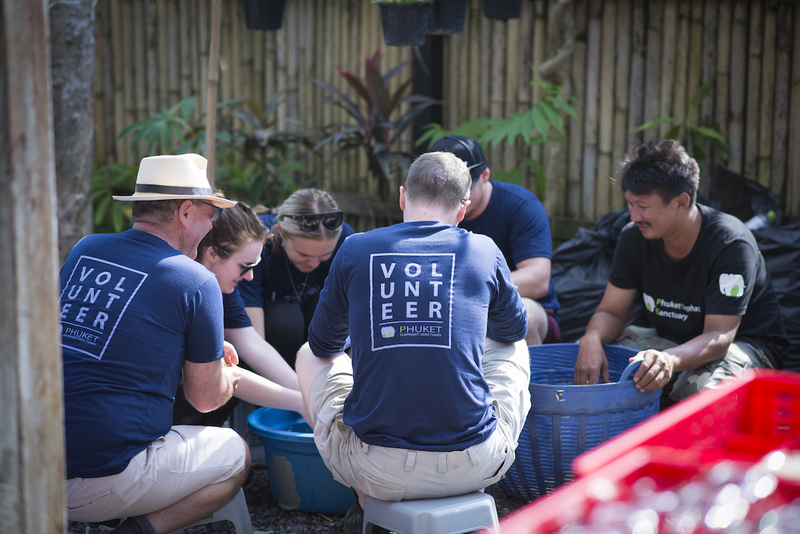 If you're physically fit, enthusiastic and able to work as part of the team in the hot Thai humid climate whether rain or sun - volunteer! You will start by joining our 'Morning with Elephants' tour to learn about our elephants, our project itself and safety standards. Food preparation, cutting banana trees, loading/unloading fruits, grasses, bamboo. Please make your reservation 1 week in advance. The volunteer program is suitable for adults aged 18 - 80 years with good health and a passion for working hard for the elephants. The one-week volunteer program runs from SUNDAY to SATURDAY (7 Days). Please arrive at the meeting point (Phuket Elephant Sanctuary’s office) check-in 3 pm - 8 pm on SUNDAY (1st day). Working days are Monday to Saturday (2nd - 7th day), hours 09.30 - 17.00. Check out on Saturday from guest house before 1 pm. This is a unique opportunity to spend a meaningful and exciting day volunteering at the first ethical elephant sanctuary in Phuket. You'll be assisting us with tasks and immersing yourself in the daily life at our sanctuary. Our one day volunteer program is available from Monday to Sunday (Except the 7th of the month between May and October). Please arrive at the meeting point (Phuket Elephant Sanctuary’s office) by 09.00 - 09.30 am. Working hours are from 09.30 - 17.00. TThe cost for a one day program is 4,500 Baht, and all proceeds go directly to elephant care. The fee includes a Thai vegetarian lunch, soft drinks and chilled water. Join us for 3 exciting days and help to care for our rescued elephants. You'll be assisting us with tasks and immersing yourself in sanctuary life while working in close proximity to the elephants. You will start with joining our 'Morning with Elephants' tour to learn about our elephants, our project and our safety guidelines. Food preparation, cutting banana trees, loading/unloading fruits, grasses & bamboo. This volunteering program is available from SUNDAY to WEDNESDAY (4 Days). Please arrive at the meeting point (Phuket Elephant Sanctuary’s office) to check-in between 3 pm - 8 pm on Sunday (1st day). Working days are Monday to Wednesday (2nd - 4th day) from 09.30 - 17.00. Check out on Wednesday from guest house before 1 pm.